PowerCLI was around for years. At the beginning VMware used name vSphere PowerCLI but over the years more and more modules ware added to support not only vSphere but other products. So, with this release the name changed to VMware PowerCLI. PowerCLI is a strong automation tool allowing you to manage your vSphere environment with CLI based commands and powerful scripts. Sometimes it is more flexible to write a quick script to do some repetitive work then do such thing in GUI all the time. It also reduces manual errors, because once the script is done it will always do the same and you can’t forget some important step in the configuration. I am using OSX for my daily work and it was a bit struggle there. In the past I had to use Windows-based machine as a jump server with PowerCLI installed, because there was no support for OSX at all (well, it was possible to install PowerCLI, but the function was quite limited). Not anymore! With PowerCLI 10 OSX is fully supported as well. 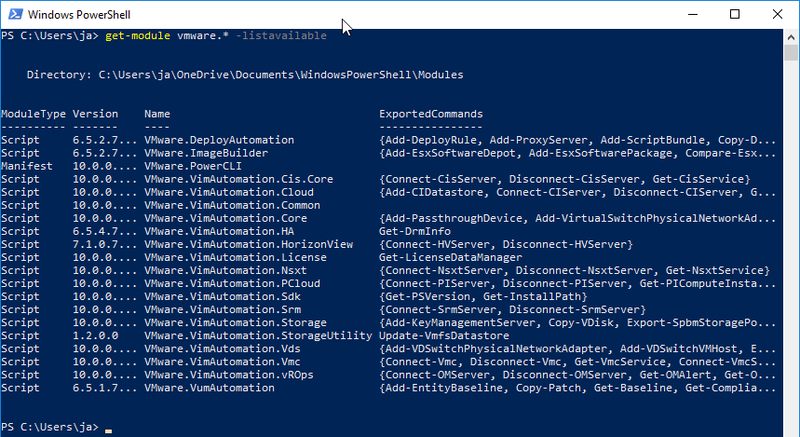 What’s new in PowerCLI 10? As said, Power CLI is multiplatform, so you can install on Windows, Linux or OSX which makes it much more useful than in the past. If you are running OSX you can have a look at the video where I have performed the fresh install as well. The approach is similar to Windows but there are few prerequisites like Homebrew or CASK that needs to be installed first. There are still some limitations in terms of avalibale modules, but it is much better then in the past. Those limitations are based on PowerShell Core 6.0 so I assume once Microsoft release new PowerShell Core more modules will be avilabel. Depends on your preferences. I have to say that after I have switched to OSX it is always pain to work on Windows aggain. And I was never fan of Linux on my workstation or Laptop.